Mobile Workforce Management Apps Discover how to simplify your field team work. Discover how to simplify your field team work. This is a set of applications that helps you to manage the staff that is working outside the office. Application of tracking and monitoring locations and attitude. GPS, kms, paths, speed, battery..., and much more. Working Day Forms helps the process automation by capturing data from your company, through all kinds of forms, templates and receipts. Plan your field team's routes, it shows each scheduled task, the details of the task and a form to report it. The field team can easily make orders taking clients from the smartphone, providing the catalog of products and customers planning to visit. Field team management is always a hard work. It takes you too much time and too many resources. Afterwards you don't have reliable data. Discover how to manage your field team in a very easy way, improving their productivity and your business organization! We have design an optimize this new version for any device. Know all the possibilities that offers this new platform. To meet diverse user preferences and enable the best possible analysis, Working Day Suite platform delivers enterprise information in a wider variety of formats including Excel, PDF, Word, CSV. An application to monitor and follow commercial and / or technical activity, that offers a 360° vision of the behaviour and attitude of your staff working outside the office. 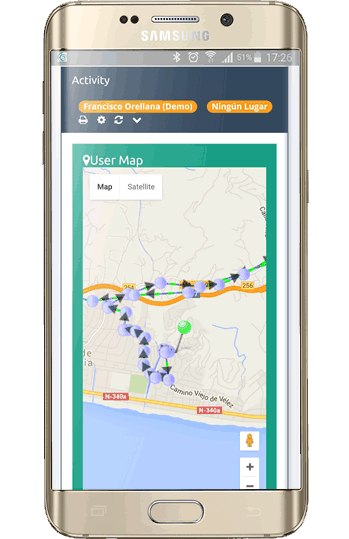 It automatically records the GPS locations of your team and the routes they have taken. It also lets you know the kilometres travelled, battery charging, power on / off, user downtime, if they made their scheduled calls, who did not answer the phone, SMS and much more. This app is installed on the Smartphone or Tablet, and it takes the GPS and CELL locations and send them to the web platform on the cloud so you can consult through a private access. 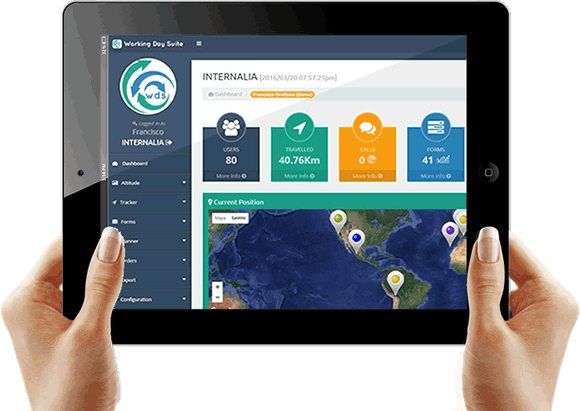 The admin user can see all the gps locations, routes, kms, speed, on/off, calls from their workforce in real time from any computer, tablet or smartphone with total security. It easily records information from the cell phone, wherever you are, and never makes a mistake. An application that automates the process of obtaining data from your company, through all kinds of forms, templates and receipts. Get your customer's digital signature and obtain perfect proof, as well as photographs of the work that has been done. What's more, it sends a personalized PDF report by email with all the information, the user name, a map from where it was sent, the photograph and signature... All personalised with your corporate image. From the web platform the admin user creates different forms with all the fields the company needs. He can assign each form to each user and to their customer, or a group of users. 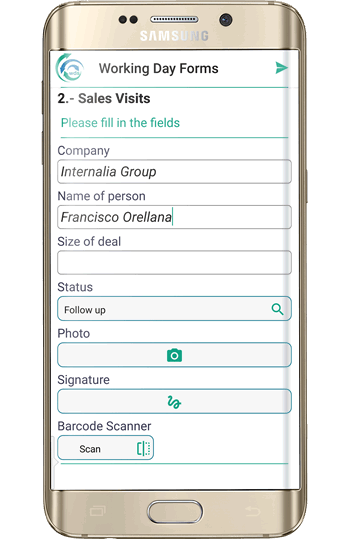 The sales man can see the forms assigned to him on his smartphone, he just has to click on it and fill out the fields on the move. He also can add photos and the customer's signature. All data are sent directly to the office in .pdf format by email and is recorded on the web platform in real time. 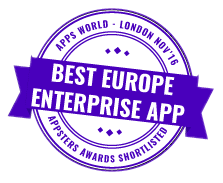 An application to manage your workforce's routes effectively. Send each of the visits to be carried out straight to their mobiles, along with the details of the task and a fulfilment form. Know straight away what is pending and what has been done, and check user deviations and the exact GPS location the report was made. The user admin, through a private access, configure a specific work plan for each member of the company's commercial or technical staff. He assigns each member a task, with description and form to complete. The tasks are planned on the web and automatically fall to users on the smartphone. The rep in mobility displays real-time tasks through his mobile device and can indicate when a job is done. The supervisor at the office can see the jobs done and the jobs that are pending to do as well as a weekly chart with the tasks per users. 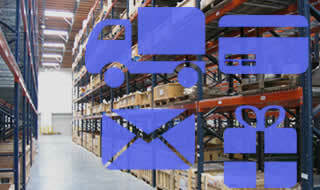 This is an effective solution for distribution companies or ones that handle product/Client catalogues. The user can easily take orders from clients on their cell phone, having the product catalogue and the schedule for pending visits at hand. Orders are available at the headquarters as soon as they are sent, what's more you will receive an email with all the order details. 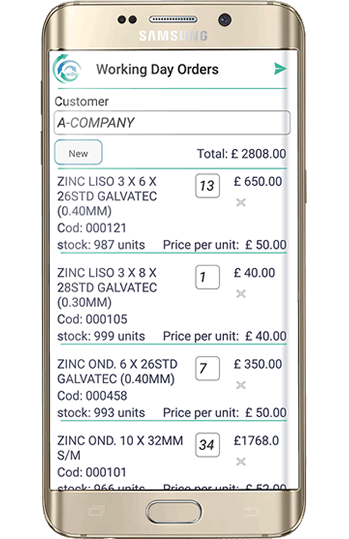 You can import the product catalogue from a file (in an electronic format), and assign price lists to each customer. The rep displays on his smartphone the list of clients to visit and after selecting one, takes the shot order very easily, making click on each product in the catalog and indicating the required quantity. 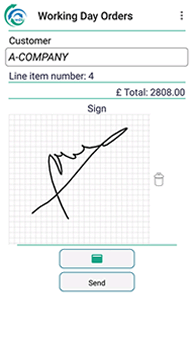 The customer signs acceptance of the order on the mobile screen and then the application sends a PDF document with the details of the order with the signature of the customer by email and also stored in the web platform automatically, being available at any time for display and export. Working Day Suite creates a detailed report of the visits , detailing routes and different actions in the customer place, including photographs. Manual recounts about kms travelled, business reports and outdated administrative procedures have been replaced by online reports of what is happening. This allows an increase of 25% of the collector visits per day. 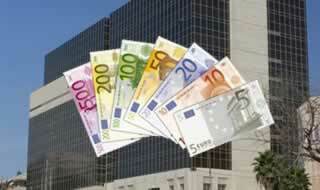 COMMERCIAL SECTOR: Supermarkets, sales of materials and products, shopping clubs. Working Day Forms for monitoring visits and sending information from potential customers in an user-friendly report. In addition, Tracker lets you know the kms travelled by sales executives, in order to make appropriate payment for fuel to employees. 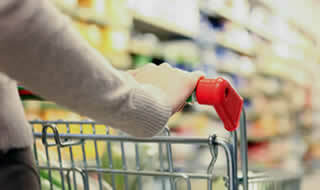 Increase in sales revenue and a marked decline in returns on products for expiration dates. 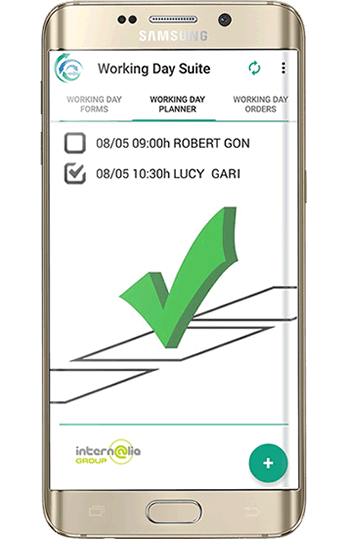 Working Day Planner & Forms to ensure the support of technicians, security staff or cleaning jobs. On this way, companies can guarantee its customers that they can trust in them to provide them their services. Security, technical or cleaning services are being fulfilled turn to turn for their employees. 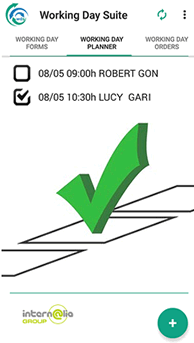 Working Day Orders generates a daily report of the visits to each client. 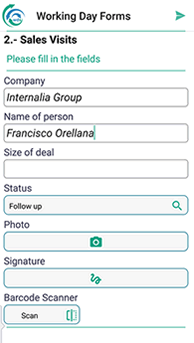 On this way you can place orders for customers on the go with photo and signature that aproves the order at the office, and improves the company workflow.